April 28, 2016 – Montreal, Quebec – Critical Elements Corporation (“Critical Elements” or the “Company”) (TSX-V: CRE) (US OTCQX: CRECF) (FSE: F12) are pleased to announce that Critical Elements and Lomiko Metals Inc. (“Lomiko”) (TSX-V: LMR) (OTCQX: LMRMF), (FSE: DH8B) have entered into an option agreement (“Agreement”) for Lomiko to acquire up to a 70% interest in the Bourier project. “This option agreement with Lomiko will allow the Bourier property to be explored in detail for a Lithium Pegmatite discovery. Critical Elements is currently focused on the development of its Rose lithium project. With Lomiko farming into the Bourier project, shareholders of both companies will be able to benefit from successful exploration of a highly prospective project,” stated Jean-Sébastien Lavallée, President and CEO, Critical Elements. incurring or funding Exploration Expenditures aggregating not less than $750,000 on the Property, of which an amount of $350,000 must be incurred or funded before December31, 2016 and an amount of $400,000 before December 31, 2017.
delivering the Resource Estimate to Critical Elements on or before December 31, 2018. On the estimation of a drilled defined resource (NI 43-101 compliant) of 20,000,000 tonnes at a cut-off grade of 0.6% LI2O (all categories) a payment of Cad $1,500,000, payable in cash or in common shares of Lomiko at the sole discretion of Lomiko. Following the exercise of the First Option by Lomiko, and in addition to the amounts paid, common shares issued and Exploration Expenditures incurred or funded by Lomiko under the First Option and thereafter under the Second Option, as applicable, Critical Elements shall receive a royalty equal to 2% net smelter returns resulting from the extraction and production of any Minerals on the Property. The Royalty including the right of Lomiko to purchase a portion thereof (1%). During the currency of this Agreement, Critical Elements shall act as the operator and as such, shall be responsible for carrying out and administering the Exploration Expenditures on the Property, in accordance with a work programs approved by the Parties regarding the Property. The Bourier project consists of 228 claims for a total ground position of 11,579.28 hectares (116 km2) in a region of Quebec that boasts other lithium deposits and known lithium mineralisation, as shown in the maps and table below. The Bourier project is potentially a new lithium field in an established lithium district. Table 1. 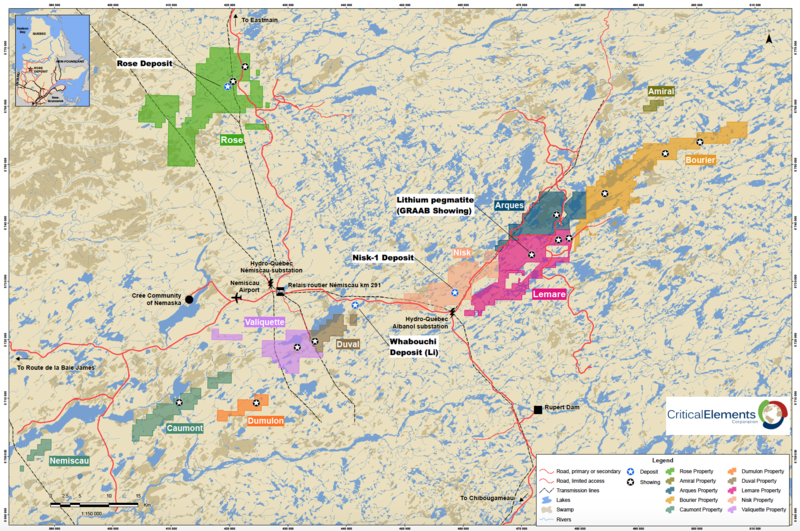 Lithium resources of the James Bay area. The Bourier property is located within the Opinaca Subprovince. Metagraywacke, derived migmatite, and granite characterize this subprovince. Poly-deformed schists occur at the belt margins, whereas the interior portions are metamorphosed to amphibolite and granulite facies (Percival, 2007). Mineralization in the Opinaca subprovince includes rare-metal occurrences within peraluminous granites and associated pegmatites. A Technical Report has been performed by InnovExplo in 2012 Technical Report on the Bourier Property (according to Regulation 43-101 and Form 43-101F1) for Monarques Resources. The area is characterized by metasedimentary rocks, mainly biotite paragneiss containing minerals typical of regional amphibolite metamorphic facies, and amphibole-plagioclase gneisses (amphibolites) of olcanic origin (Valiquette,1975). The northern boundary of the property is marked by intrusive pink granite . The metasedimentary rocks in the centre of the property are intruded by mafic and ultramafic rocks, granites, pegmatites, and late diabase dykes, the youngest rocks of the area. The amphibolites contain numerous lenses of ultramafic tremolite schist that follow the foliation of these amphibolites. The biotite paragneiss crops out mainly in the low-lying ground. The paragneiss incorporates sills of mafic rock (amphibolites) and ultramafic rocks, metavolcanic layers, granite stocks and dykes, and pegmatite masses. These rocks dip on average 35° to the southwest (Valiquette 1975). The ultramafic rock in outcrop is mainly serpentinite, although narrow sills of ultramafic amphibole rocks are also present. These rocks may be crosscut by pegmatite dykes. Several granite intrusions cut the metasedimentary rocks. In some areas the granite intrudes the biotite gneisses. This granite is usually massive with very weak gneissic texture. The pegmatite dykes or sills cross-cut all the other rocks with the exception of the diabase. The pegmatites occur as two (2) sorts: pink, associated with oligoclase gneisses and granite, and white, associated with metasedimentary rocks. White pegmatites are generally fine to coarse grained containing muscovite, almandine Garnet, black tourmaline (schorl), magnetite and biotite. Muscovite grains can be up to a few centimetres in size. The pink pegmatite ranges from fine to a very coarse grained variety comprising very large microcline crystals reaching up to 30 cm long. Besides quartz, microcline and plagioclase, the pegmatites also contain magnetite as large crystals up to 15 cm in length. Accessory minerals are apatite and Garnet with trace amounts of spodumene. The property is adjacent to the North-East to the Lemarre Lithium property option by Critical Elements to Lepidico in February 2016 (see press release dated February 11, 2016). Figure 1. Location of known lithium deposits and showing and Bourier Showing in the James Bay area of Quebec. Initial exploration at Lemare was undertaken in 2012 by Monarques Resources Inc. who discovered a “granite pegmatite dyke containing a considerable amount of spodumene.” The pegmatite ranges in apparent thickness from 4.8 to 14.2 metres and was followed for close to 200 metres in length on surface. The full length of the dyke remains unknown and is open in both directions. The pegmatite is undrilled so the depth extent also remains unknown. Outside of work program complete between 2010 and 2012 for Zinc-Copper and Gold by Resource Monarque, there has been no lithium exploration undertaken at Bourier Property. Based on other lithium deposits around the world, it is a common occurrence for pegmatites to exist in “swarms.” Initial compilation of historical geological map and historical work already confirm the presence of pegmatite dyke and presence of spodumene and rare metals indicator. No value has been find to date in the compilation work as it is preliminary work. Jean-Sébastien Lavallée (OGQ #773), geologist, is a shareholder of both companies, President and Chief Executive Officer of the Company and a Qualified Person under NI 43-101, has reviewed and approved the technical content of this release.